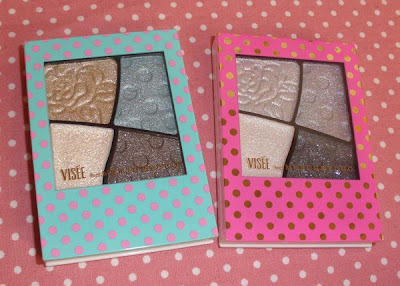 Kosé Visee released 2 Limited Edition Brilliance Forming Eyes palettes in collaboration with a Japanese fashion brand (Mercury Duo). 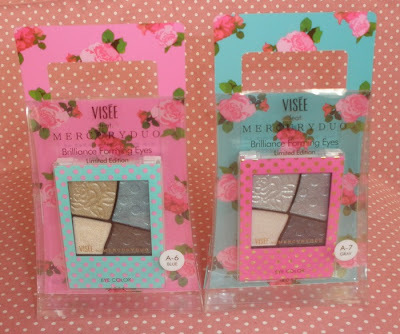 The palettes come in 2 different cute pink/turquoise compacts in pretty boxes looking a bit like shopping bags. 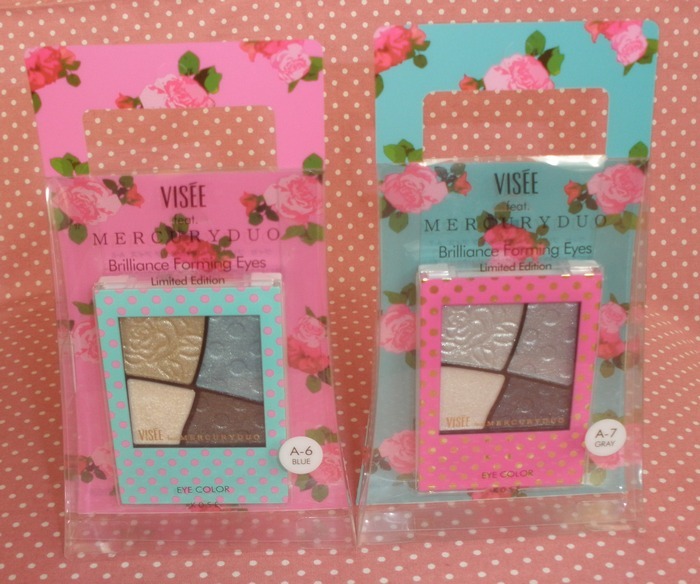 The powders have cute roses and dots engraved, too. The color themes are blue (palette A-6...though it´s more turquoise/beige) and gray (A-7...which I´d rather describe as silver). 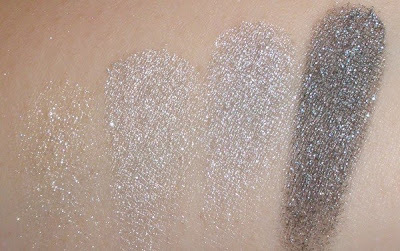 The texture of the Brilliance Forming Eyes is really nice as it´s quite silky and soft with a beautiful shimmery finish and a good level of pigment. 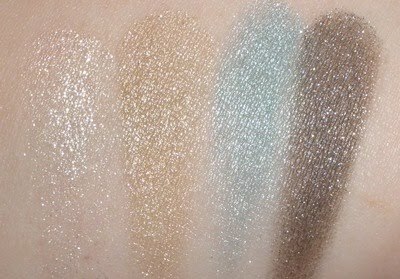 The shimmer is on the pearl side, not glittery (except for the cream shade) so I really like the palettes. Each quad contains a glittery cream shade and 3 soft powders. I did experience some creasing when wearing the A-6 palette but I wore it for a really long time and did some outdoor sports so I think it would have stayed better during a normal day. 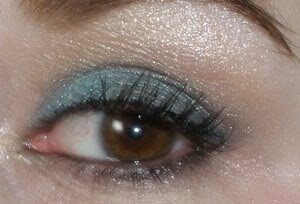 A-6 Blue: Ivory cream shade, golden beige, bright turquoise (turns to a greenish color on my eyes rather than blue) and deep taupe gray. 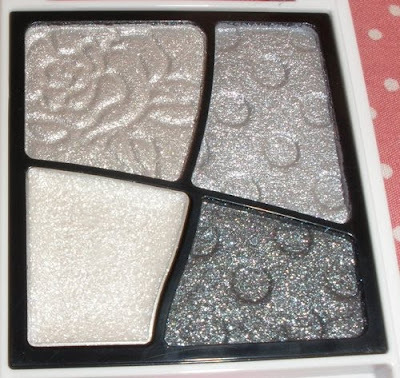 This palette is versatile as you can create a natural day look or add a pop of color. A-7 Gray: White cream shade, light silver, light-medium silver and deep gray with lots of blue shimmers which turns it into a deep blue-gray on me. The 2 silvers are pretty much alike, I wish one was to be significantly lighter. I got mine from Ichibankao. I don´t know if any other online shops will stock this item. 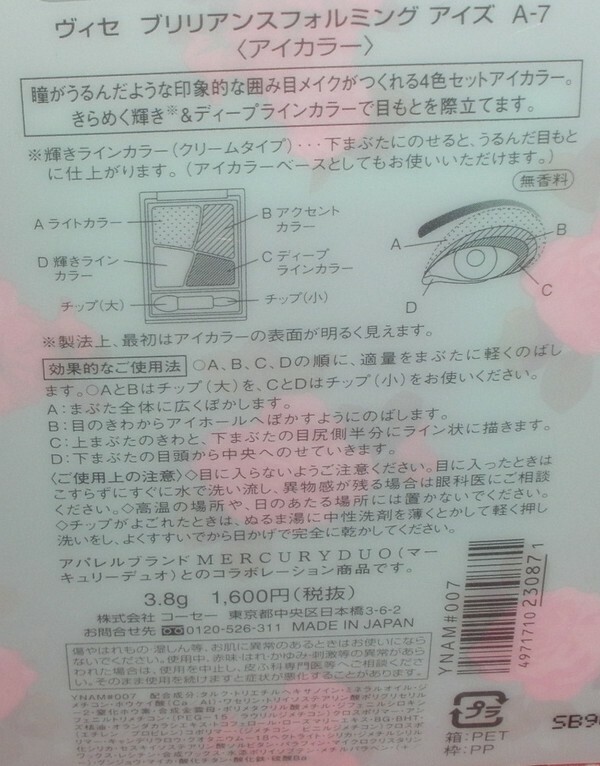 Retail price is 1680 Yen per quad. My dearest friend Iris from Rouge Deluxe did 2 great EOTDs with these palettes! Click here for A-6 and here for A-7! p.s: have u received my email? Love the two looks you did with these palettes! 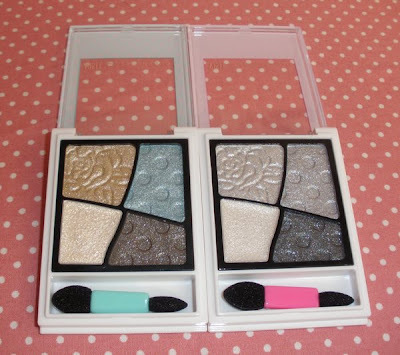 I like them a lot too except for the cream liner shades. And the polka dotted cases are just too cute! I just didn´t find another mascara to compete with this mascara at all.. I think I might give a try to the new volume mascara from Jill stuart as it comes with a comb applicator, too! I also got the new Fasio mascara with a comb applicator but it´s not nearly as good as the MM one! i have a6blue it's so cool. 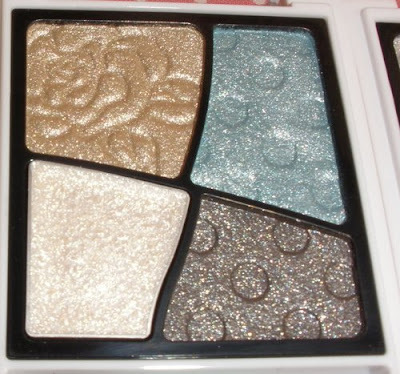 that's my first blue shade palette.